Only in California can you have a brand new, yet vastly experienced FBO. Cutter Aviation/Bob Hoover Jet Center, founded in 1928 by William Cutter, just opened their newest facility in Van Nuys (VNY) in July. I spoke with manager Tom Magglos, a veteran ATP rated corporate pilot with five years of FBO management experience, about what makes this facility special. "I believe that the combination of the decades of experience of Cutter Aviation, plus the involvement of aviation pioneer Bob Hoover speaks volumes about what to expect!" In addition, Magglos was proud to be the Piper sales and HondaJet sales and service centers for the region (forthcoming). Essentially, the ideal way for one to live their life is to be economical, realistic and invest their hard earned money wisely. When life throws at you opportunities to travel, the average American will automatically choose to go by way of airline: Fact. But, why is this the case? For a lack of better reasoning we will say this; people believe that airline travel is cost-effective, statistically safe and highly effective. However, as aviators, we must stop and question this. What viable percentage of those American people are aware that there are other ways? Do they know that airplane travel does NOT always entail large airports, waiting in lines, highly invasive security checks or missing baggage? With airline travel comes many burdens that are avoidable; simple as that. I’m here to tell you about a different way to go about things; a newer way. Diamond Aircraft recently developed a program known as DiamondShare with hopes of making flying make sense again. This dynamic new program has been designed for simplicity, in turn making the economics of personal aviation sensible, and a real possibility. DiamondShare was inspired and created to provide all pilots with a more affordable option in order to have ownership and/or access to an amazing new and modern aircraft. The secret is "sharing". Recently I was given an opportunity to meet with one of the top advisors for the DiamondShare program, John Armstrong. John broke this down so well for me, I was instantly on board, what a fantastic program this is! I can’t think of a better promotion to offer a new or a young pilot fresh on the market for a single engine aircraft. Everyone wants the hottest items on the market be that technology, automobiles, boats or aircraft. "Yes I want the Garmin G1000, yes I want the all glass cockpit, and yes I want the auto-pilot feature, but let’s be realistic; the hottest aircraft on the market certainly won’t be the cheapest. This brings us right back where we started; I want to be economical, I want to be realistic, and I want to invest my money wisely. So check this out, did you know that on an annual average, most aircraft owners will only use their planes 80 - 100 hours per year? That equates to roughly 5% of the total hours in a working year, excluding weekends of course. Obviously, that scenario is less than ideal and it’s certainly not economical or wise. Not to mention, along with aircraft ownership comes numerous fixed costs that are essentially inevitable; including insurance costs, hangar fees as well as avionics subscriptions. So why would anyone invest so much money in the purchase of a brand new, top of the line aircraft? The answer is simple; most people wouldn’t. Due to these factors, the average buyer on the market for an aircraft (especially in an economic crisis) is going to "settle" for an older, more outdated model; if for no other reason, simply to justify their investment. DiamondShare wants to change this. With the Share and Save Program, the new owner can now leverage his/her assets while radically reducing their cost of ownership. The owner still maintains full control and as a bonus, this usually enhances tax advantages. Moving right along, the aircraft that I am discussing is the Diamond DA40 XLS; a fantastic and beautiful, completely state of the art aircraft. Say you are a student pilot (such as myself); perhaps you are not seeking aircraft ownership right away. Nonetheless, depending on how much a person enjoys the freedom of flight, how much would that person realistically invest every single month on aircraft rental and fees? Aside from that, your local FBO only has so many training aircraft available for hourly rent; this doesn’t allow much capacity for personal travel. $135.00 per hour seems tolerable; until you reach 8 or 9 hours that is. But what other choice is there? In conclusion, the DiamondShare program was inspired and created to provide pilots from every walk of life a brand new opportunity to make a gratifying investment. Whether you seek full ownership or just easy and convenient access to an amazing and modern aircraft, DiamondShare has potential for you. By pooling your love for aviation with other flight-goers and literally sharing the wealth, you are now capable to own the latest and greatest, hottest new aircraft on the market; the sky is literally the limit! 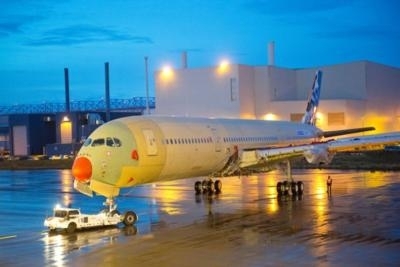 Airbus has successfully completed the main structural assembly and system connection of A350 XWB ‘MSN-001’ – the first flight-test aircraft. The aircraft is shown here on its wheels for the very first time moving out of the main assembly hall (Station 40) at the recently inaugurated “Roger Béteille” A350 XWB Final Assembly Line in Toulouse. It then entered the adjacent indoor ground test station (Station 30). The assembly work performed in Station 40 included the successful electrical power-on of the aircraft's entire fuselage and wings. Soon work in Station 30 will start by testing the aircraft's hydraulic system, followed by the full electric and hydraulic power-on of the aircraft which will be completed by around the end of the year. This will mark the start of several weeks of comprehensive functional system testing. After the A350 XWB MSN-001 exits station 30, the aircraft will go through a series of extensive production and certification / development tests, be painted and have its engines installed. It will then be delivered to the flight-line and be readied for its first flight in mid-2013. While the U.S. Light-Sport Aircraft sector is just eight years old, and the first FAA-accepted aircraft began arriving in 2005, Flight Design GmbH has been involved with aircraft development and manufacturing aircraft for 25 years. To mark this milestone, the company is offering a special “Jubilee” series of their models with unique features and value pricing. Flight Design will build the special Jubilee edition in a very limited series of airplanes. The specially constructed airplanes add a personal touch, a unique equipment list, and special pricing. The Jubilee treatment can be applied to any of several models in production, including CTLSi, CTSLi (Supralight) or MCi. To insure quality and desirability, only 25 Jubilee airplane models will be manufactured. “Each 25th Anniversary Jubilee airplane will have an upper management ‘Godfather’ assigned to personally monitor its build process to ensure our extraordinary level of quality is attained throughout every step and detail of manufacturing,” said Betsch. Jubilee models will have a special inscription plate affixed with signatures of Flight Design’s top managers, the name of that aircraft’s “Godfather” and its sequential number within the series of 25 models built for the celebration. Flight Design’s 25th Anniversary Jubilee airplanes will have the following standard features: Rotax 912iS engine; Dynon SkyView avionics, dual 10-inch displays (for LSA/EASA 1,320-pound CTLSi and MCi) or dual 7-inch displays for CTLSi at 1,040-pound, or single 10-inch display for CTSLi; Dynon autopilot; 8.33-kHz communications radio with Mode S transponder; Garmin 796/795 GPS; electric stabilator trim; two upgraded Bose A20 Active Noise Reduction (ANR) headsets; input capability for mobile phone and music; special two-tone leather interior, including leather instrument panel and carpeting similar to the interior in Flight Design’s new four-seat C4 mock-up as seen at airshows; and, a special 25th Anniversary theme exterior design painted on aircraft (not decals) with 25th Anniversary commemorative logo. A special series of options is also available at attractive prices. An extended warranty of five years for structural parts and three years for mechanical parts plus a 25th Anniversary leather flight brief case will complete the limited edition airplanes. The program is available effective immediately until the 25th Jubilee airplane is built with delivery occurring from February to June, 2013 at the rate of five airplanes per month. 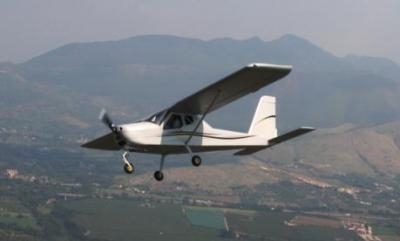 Tecnam North America has launched the new P92 Echo Classic Light at a special introductory price through to the end of 2012. Tecnam says the airplane responds to market demand for a no frills, basic, aircraft that will still retain the great flight characteristics of the best selling P92 family of aircraft. The P92 Echo Classic Light will appeal to budget conscious buyers who are looking for a low cost, predominantly metal, factory produced, Light Sport aircraft from a major manufacturer. Rotax 912UL 80 HP engine which can use standard grades of automotive fuel and is even more economical than the already frugal 100HP Rotax. All metal construction for structural components. Special light weight seats that are fully adjustable in flight Steerable nose gear with center handbrake. Single fuel tank holding 11.9 gallons (second tank optional). All required day VFR instrumentation for flight outside of controlled airspace. MTOW 1102 lbs; Standard useful load 496lbs; 424lbs of payload. Max Cruise 103 kts Endurance 3 hours (single tank). Standard two year/200 hour manufacturer’s warranty. Prices start at only $74,999 for a day VFR aircraft that can legally be flown away from Hanover County Airport at this price – no hidden charges or surprises. A limited number of upgrade packages will be available at competitive prices.